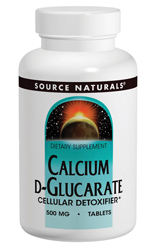 Source Naturals' Calcium D-Glucarate includes the patented compound glucarate which has been shown to enhance the major detoxification pathways in the body. Calcium D-glucarate, the calcium salt of D-glucaric acid, is found naturally in the human body and in a variety of fruits and vegetables. Animal studies have shown that high doses of calcium D-glucarate inhibit beta-glucuronidase, thereby enhancing the process of glucuronidation, in which foreign organic compounds, fat-soluble toxins and excess steroid hormones such as estrogen are detoxified and excreted from our bodies. Ingredients: (per serving) Calcium (from 1,000 mg calcium d-glucarate) - 124 mg.
Other Ingredients: sorbitol, stearic acid, modified cellulose gum, silica, and magnesium stearate. Warning: For adult use only. Calcium D-glucarate may increase the body's excretion of certain medications. If you are pregnant, may become pregnant, breastfeeding, or taking any prescription drug, consult your health care professional before using this product. Do not use if either tamper-evident seal is broken or missing. Suitable for vegetarians. Suggested Use: 2 tablets with a meal three times daily. Additional benefits may be obtained by taking this product with antioxidants such as vitamins A, C, E and beta carotene.